I believe that most people like the idea of trees being planted – as long as they are in the ‘right place’. Small, negligible seeds unfurling to create little, delicate saplings growing on and upwards into woody giants that dominate a landscape. But why would we purposefully plant trees? Here are some of the benefits that tree planting/woodland creation can provide. Each individual tree provides a habitats. Wooded habitats are some of the most diverse habitats in England; with many birds, mammals, insects and plants specialising in woodland environments these habitats are critical for biodiversity. Creating even small areas of woodland has the potential to greatly increase the number of species in almost any landscape. Lesser? 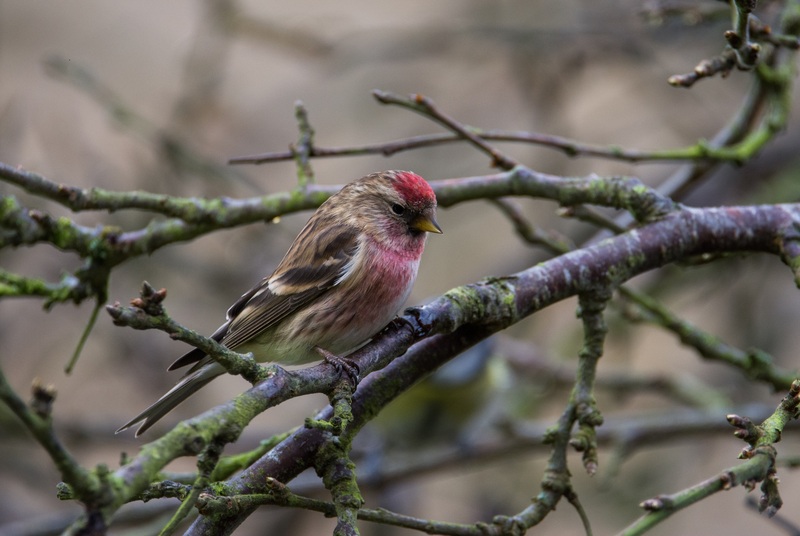 redpoll – this RSPB Red status bird has suffered severe population declines in the UK. It relies on wet woodland species like birch and alder. It is important to look at woodlands from a landscape scale. Connectivity is the word used to evaluate how connected/joined up otherwise isolated fragments of habitat are. It is always a big advantage for tree planting if it helps to connect existing woodland areas and so allows woodland species to move freely across the landscape. Newly planted woodland near Skipster Hagg Woods, Appleton le Moors. The word Hagg suggests the land here has long been wooded. This new planting is an extension of an existing native woodland, which should improve connectivity through the landscape. It is now widely accepted that planting trees and woodlands has benefits for the management of water catchments. Woodland filters sediment and nutrient run off from the land if planted between the source and a watercourse, and so can greatly improve water quality. 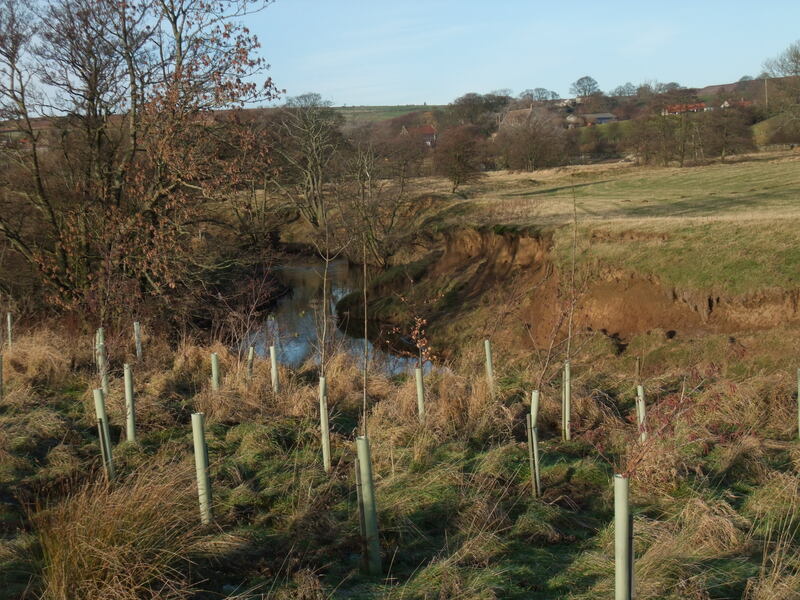 Also when trees are planted along a river catchment they can help to slow down the flooding effects of heavy rainfall events by increasing the porosity of the soil. Water is more readily absorbed into the soil, thanks to the roots of trees, before being released into water courses of the catchment. Just as trees can slow down the movement of water they can also minimise the movement of landforms. The roots of trees help bind and stabilise river banks and hill sides. Trees hold landforms together minimising erosion and the displacement of soil, the effects of which can in some cases be devastating. Small scale riparian woodland planting in the Esk Catchment. The opposite bank is slumping and loosing soil resource into the water. Trees and woodland copses carefully located on a holding can provide useful shelter for livestock and gamebirds. It has been demonstrated that shelter provided by trees has resulted in significant reductions in cold, wet and windy weather lamb losses. 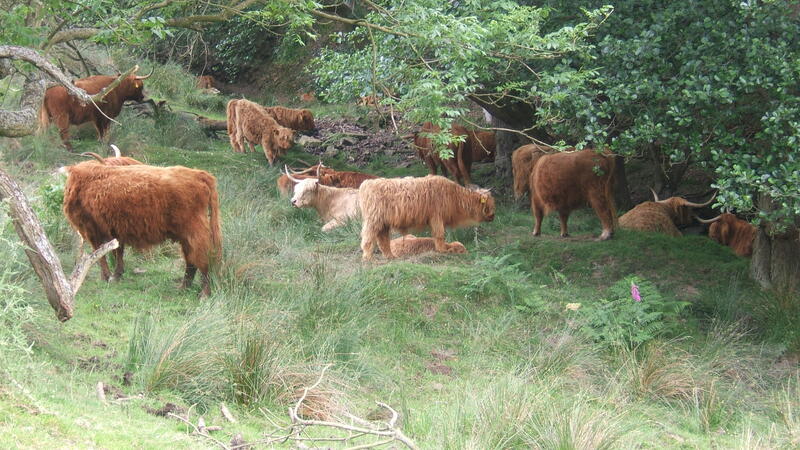 Highland Cattle on Levisham Estate taking advantage of the the woodland cover on a hot day. One of the causes of climate change is the release of greenhouse gases (e.g. carbon dioxide) into the earth’s atmosphere trapping heat. Trees produce energy to live and grow by using sunlight to convert water and carbon dioxide through photosynthesis; a process which produces oxygen. So trees are using up Carbon Dioxide, storing carbon and generating essential oxygen. As well as providing a land management tool, the presence of trees and woodlands can have positive impacts on the health and wellbeing of people. Trees and woodland are intrinsic to many landscapes, particularly so in the North York Moors. Woodlands provide amenity value as local cultural assets that can last for generations if looked after properly. Imagine the feeling of personal achievement in planting a new woodland that will grow and mature into the future, making a living mark on an evolving landscape beyond the constraints of a human lifetime. View from Chimney Bank down into Rosedale. Trees in the right place can really compliment the landscape and add amenity value from notable viewpoints. 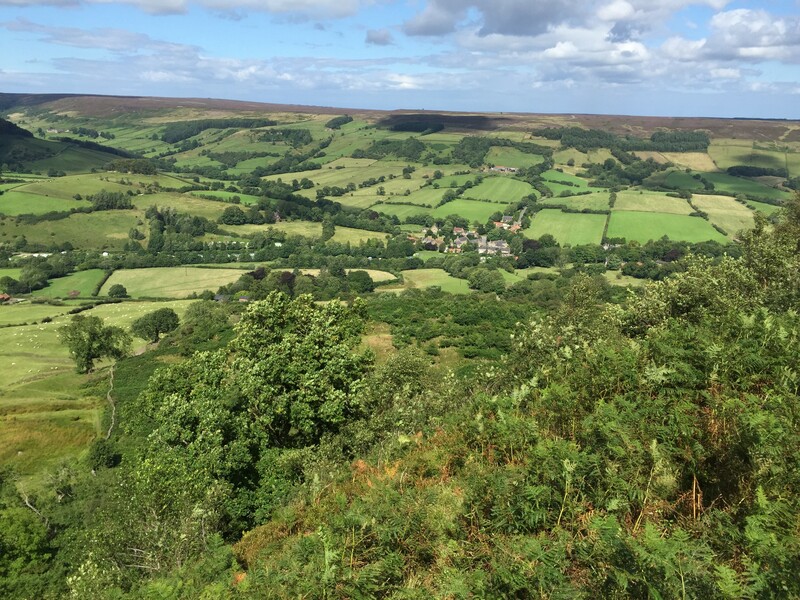 The National Park Authority is looking for landowners and partners to create new woodland across the North York Moors. 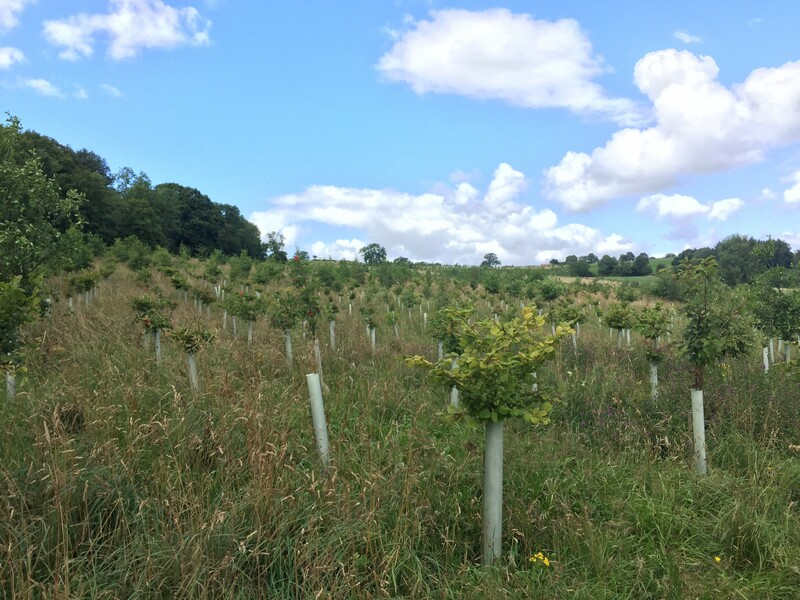 Funding is available for deciduous woodland planting projects of 1 hectare (2.5 acres) and above; the funding can cover the total costs of planting and establishment. If you are interested and would like more information please contact me by email or ring me on 01439 772700. This entry was posted in Biodiversity, Climate Change, Conservation, Environment, Funding, Landscape, Local Community, National Park, Natural Environment, Natural Heritage, North York Moors and tagged Connectivity, Habitat, Land management, Landscape, Tree planting, water quality, Woodland by North York Moors National Park. Bookmark the permalink.